Welcome to Family Eye Care Center! Your Optometrists in Laurens and Clinton, SC. Welcome to Family Eye Care Center in Laurens and Clinton, SC. Dr. Tom MacMillan, Dr. Bernadine Donaldson and the Family Eye Care Center team strive to provide the finest in optometry services. We invite you to browse our website to learn more about our services, and invite you to join our patient family by scheduling an eye exam appointment at our Laurens or Clinton offices. Family Eye Care Center is a full service eye and vision care provider and will take both eye emergencies as well as scheduled appointments. Patients throughout the Laurens and Clinton areas come to Family Eye Care Center because they know they will receive the personal attention and professional care that is our foundation. We are dedicated to keeping our patients comfortable and well-informed at all times. At Family Eye Care Center, we will explain every exam and procedure and answer all of our patient's questions. Additionally, at Family Eye Care Center, we offer vision financing options and will work with vision insurance providers to ensure good eye health and vision care for all of our patients. Our one-on-one approach to optometry makes us the eye and vision care providers of choice in the Laurens and Clinton areas. Our optometrist offer the following services: complete eye exams, contact lenses, glasses, glaucoma testing, and pre- and post-operative care. For a complete list of services, visit our services page or call our Laurens office at (864) 984-2020 or Clinton office at (864) 833-5555. 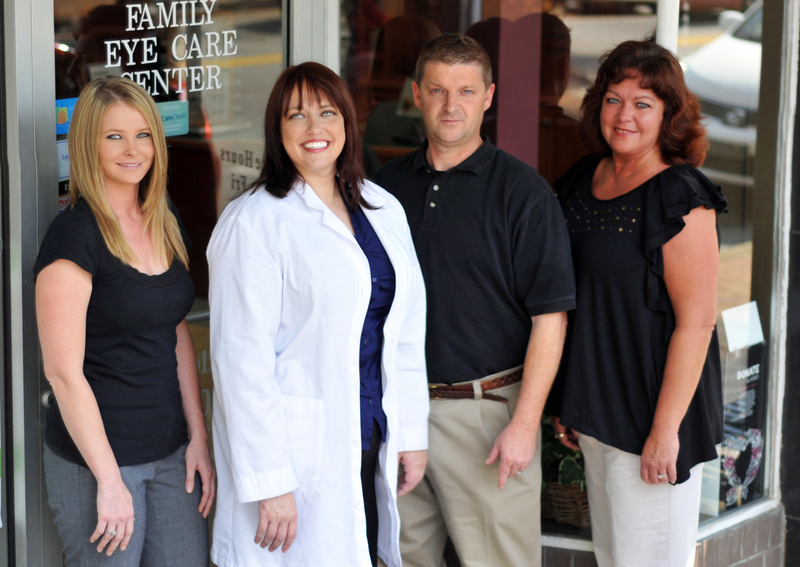 At Family Eye Care Center, we are dedicated to providing high-quality optometry services in a comfortable environment. Call us at (864) 984-2020 or (864) 833-5555 or schedule an appointment today online. Dr. MacMillan was born in Huntsville, Alabama. He and his wife Ginger were high school sweethearts. Dr. MacMillan graduated from Huntingdon College in Montgomery, Alabama. He then attended the University of Alabama School of Optometry in Birmingham, graduating in 1993. Dr. MacMillan purchased the practice in Clinton in the fall of 1993. Ginger and Dr. MacMillan have 3 children, Austin, Isaac and Carley. He resides in Clinton and is a very active member of First Baptist Church of Clinton. Dr. Donaldson earned her Doctorate of Optometry with honors from The Ohio State College of Optometry and has been with Family Eye Care Center since 2010. She is a member of good standing in the American Optometric Association and the South Carolina Optometric Physicians Association. She is also a provider for Infantsee, which provides a free vision screening to infants between the ages of 6 and 12 months, regardless of the ability to pay. In addition to working in both the Laurens and Clinton locations, Dr. Donaldson serves as a Clinical Director of Opening Eyes for Special Olympics of South Carolina. She also serves on the advisory board for The Bell Center Foundation for the Blind. Dr. Wood is a board-certified optometrist licensed to diagnose, treat and manage a broad spectrum of visual disorders and ocular disease. Dr. Wood has special interests in pediatrics and vision therapy. She serves as a provider for Infantsee, a program that gives free exam exams to children who are 6-12 months of age. She is a member in good standing of the American Optometric Association and the South Carolina Optometric Physicians Association.